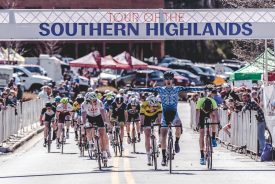 Woodstock, Georgia (Nov 30, 2018) – Tour of the Southern Highlands Stage Race (TOSH), announces the 3rd year of partnership with host cities Woodstock and Ball Ground, GA and new schedule for 2019. The ToSH is the only Pro/Am stage race east of the Rockies that doubles as a Junior National Selection Race. The race draws over 500 Pro/Elite, masters and amateurs for up to 3 days of racing. The event boasts more than $12k in cash, prizes, and offers young athletes a chance for selection to represent the United States on an even bigger world stage. Racing kicks off Friday, March 1, 2019, with a championship length, individual time trial for Pro/Elite Men, Women and Elite Juniors. An open, non-stage, community category is available for anyone wishing to test their skill against the clock.